This video has been around the internet for a while now but it’s just too good not to watch again this season. Fundy Christmas Day 1: Playing Where’s Santa? It’s is widely accepted dogma in fundamentalism that Santa is an evil creature invented to subvert the hearts of men from the true meaning of Christmas: a time to celebrate Christ’s birth by giving the pastor a new suit and his yearly bonus. Such is the hatred for all things related to Mr. Claus that every bit of Christmas decorating, cards, postage stamps, and gift-giving must be scrutinized for traces of that scurrilous saint. These traces may include depictions of reindeer, the North Pole, cookies, milk, beards, chimneys, sleighs, and Will Ferrell. Even songs with references to children listening for sleigh bells in the snow may be accused of venerating the jolly old elf. Wrapping paper must be scrutinized. Decorations must be carefully examined. Christmas cards received from relatives or friends bearing traces of Santa must be hidden away or disposed of all together. 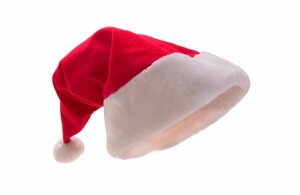 No whiff or trace of the man in the red suit shall be allowed to sully this most holy of seasons. Now hurry up and write the pastor his check. It’s that time of year when the world falls in love and peace and earth and goodwill toward men reigns supreme. Yet even in this time of merry-making and fruitcake slinging, fundamentalists will find someone to attack: Old St. Nick. If a parent tells their trusting child that Santa is real and and that he is omniscient (knows if they’ve been naughty or nice), omnipresent (can get around the world in one night), and omnipotent (not sure about this one but just go with it) then when they learn he is not real they’ll lose faith not only in Santa but will be forced to believe that God is a mere fairytale as well. Did you get that? Good. 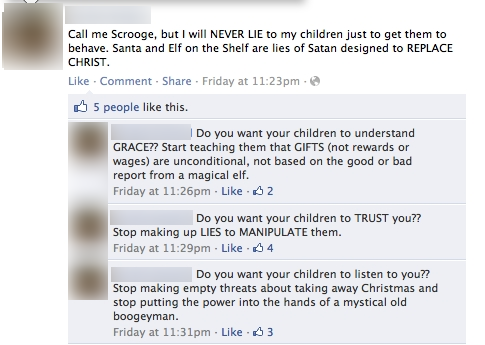 Not content to leave it there, fundies then decide to heap unto themselves further proofs that Santa is not only imaginary, he is also evil as well. The SANTA = SATAN theme is preached far and wide. Their proof for this connection? 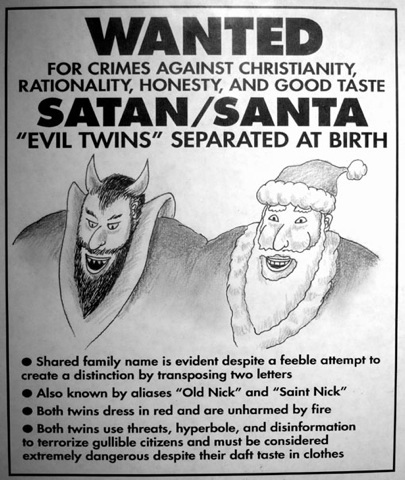 An internet Google search on “Satan Claus” [not Santa Claus Ã¢â‚¬â€œ but SATAN Claus] found over 1,700 hits! Obviously, there are many that tie the two together. He’s also a saint so we know the Roman Catholics are involved somehow which probably means it’s a global conspiracy. I don’t know about you but that settles it for me. Not only is Santa not real but he is also the devil. One can only imagine what fundies must think of the tooth fairy. 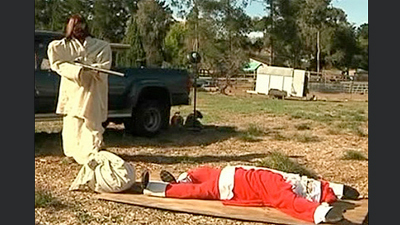 NIPOMO — A lawn display of a Jesus shooting Santa Claus has residents in one San Luis Obispo County city up in arms. The controversial Christmas display shows a Jesus figure pointing a double-barrel shotgun at a dead Santa figure. Santa’s reindeer Rudolph lays sprawled across the hood of a pickup truck nearby. Some neighbors have asked the display be removed, but its maker, Ron Lake, says it’s a work of art denouncing the commercialization of Christmas. Police said that because Lake built the display on private property they cannot force him to take it down. Some residents plan to start a petition. I have no idea what Mr. Lake’s religious beliefs are but a story with guns, dead Santa, a pickup truck and angry neighbors protesting sounds like a fundy’s Christmas dream come true. Thanks to “coffee bean” for the link.